No more guessing if your gear is protected. An LED indicator lets you know if your devices are protected (green). With our long-lasting surge technology, you'll be getting more green than Seth. With ECHOGEAR, you also get expert customer support 7-days a week, we're here for you. Have any questions? Don't hesitate to contact us, we'd love to hear from you. 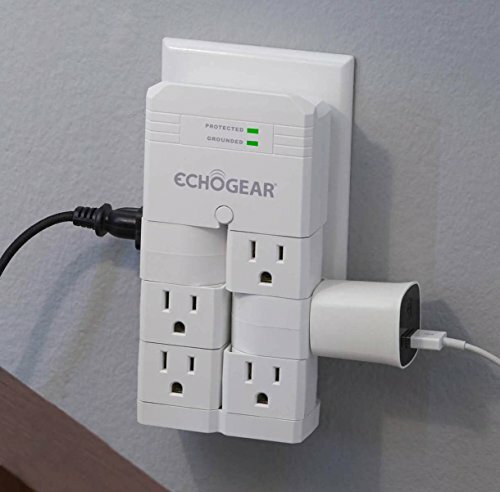 Installs in seconds over existing outlets, with a low 1.50" profile to keep your cables out of the way. Includes a securement screw to support your heavy wall warts, we can't speak for your other warts. Go see a doctor. UL safety certified with a 5 year, $25k connected equipment warranty. Your electronics won't be "hertz" with ECHOGEAR. That was a terrible electricity pun.